Browse any digital nomad retreat‘s website, and the usual suspects come up. Two-month trips to Ubud, Bali. One month trips to Cape Town, South Africa. And of course, a stint in Chiang Mai, Thailand. 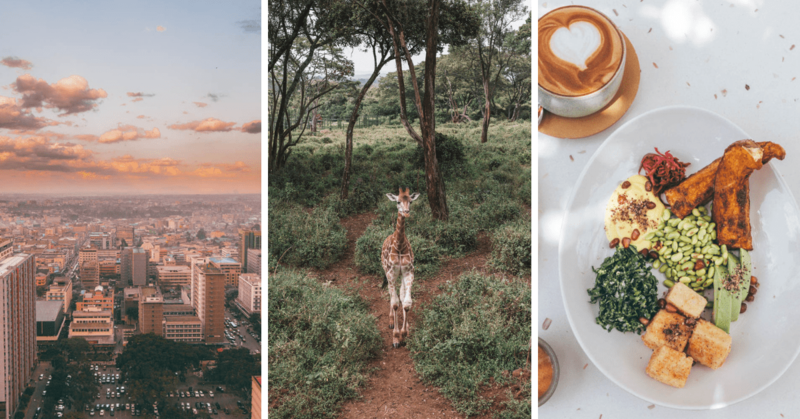 If the digital nomad lifestyle is starting to get too redundant for your liking, book your next ticket to Nairobi, Kenya! 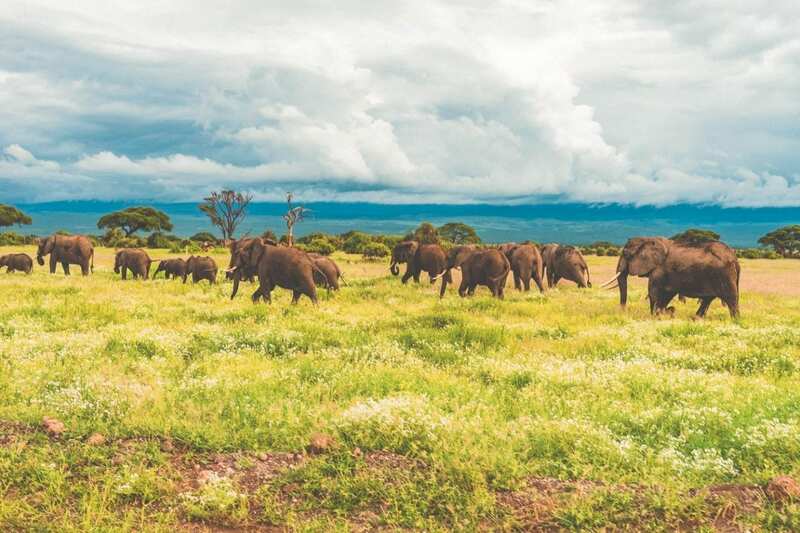 It’s a buzzing East African metropolis and is the perfect place to base yourself as you explore one of the best destinations on the continent. 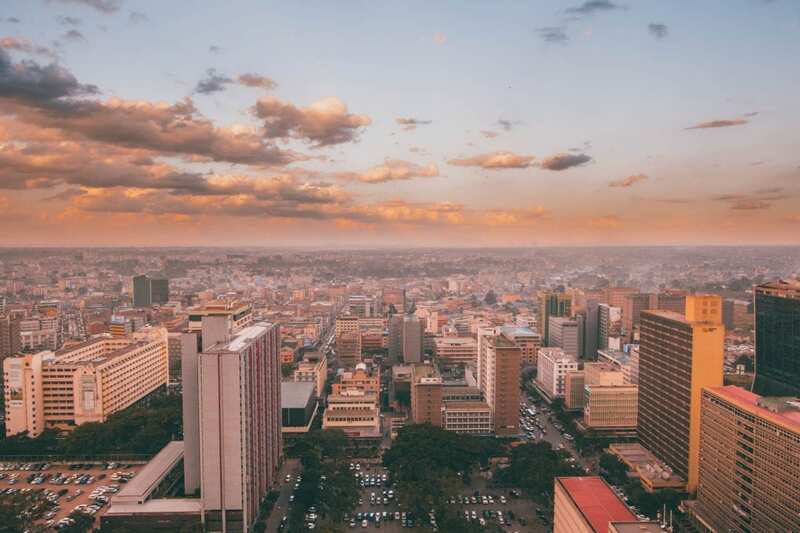 I spent a month working remotely in Nairobi and fell hard for the city within 24 hours. There’s a delicious cafe scene, vegetarian and vegan food options, cheap domestic flights and tons unique things to see and do. 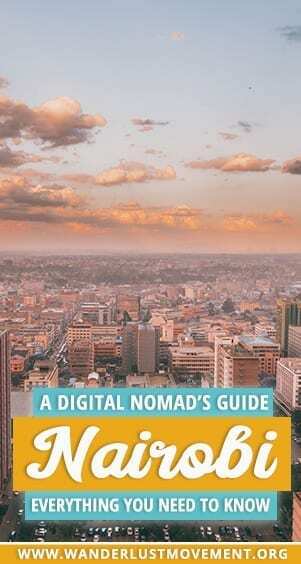 Here’s my digital nomad guide to living in Nairobi, Kenya! If you’re a South African like me, you get a 30-day visa on arrival for Kenya. It’s free, and all you need to do is fill out a form before heading to the immigration desks. Easy and fast – that’s how I like my visas! For other nationalities like US, UK, and the EU, you’ll need to pay for a visa on your arrival or arrange an E-visa. If you’re planning on visiting Rwanda, or Uganda for gorilla trekking, apply for the East African visa. If you don’t, you’ll have to pay visa fees for each country, and it’s not cheap. The best time to visit Kenya is during the Great Migration. From June to October, you’ll have the chance to watch over a million wildebeest make the treacherous journey across the Masai Mara. Rain is also unlikely, and you’ll have perfect weather and fewer mosquitos bothering you in the evenings. If you want to avoid the crowds, travel to Kenya between November and May. The hotels on the coast are almost empty, and you won’t have a problem finding good deals from tour operators. 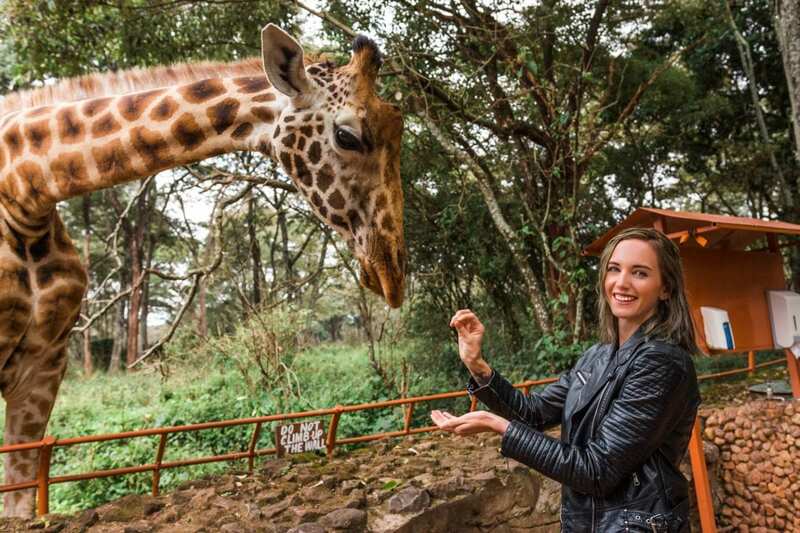 I used Skyscanner to pick up a return flight from Johannesburg, South Africa to Nairobi, Kenya for only R 3,000! Usually, flights cost between R 4,500 to R 5,000, and you can get a direct flight with Kenya Airways or fly to Ethiopia for a layover and a lower airfare price. Once you arrive at Jomo Kenyatta International Airport, you can get an Uber to your Airbnb or hotel. Taxify is another popular rideshare app in the city and has cheaper rates. I paid around 900 KES (R 125.00) for a 30-35 minute ride to my apartment. You need a Yellow Fever vaccination if you want to travel to Kenya. Your vaccination needs to be more than ten days old for it to be considered valid. On the plus side, once you get the shot, your immune for ten years! The best way to get around Nairobi as a digital nomad is with Uber. 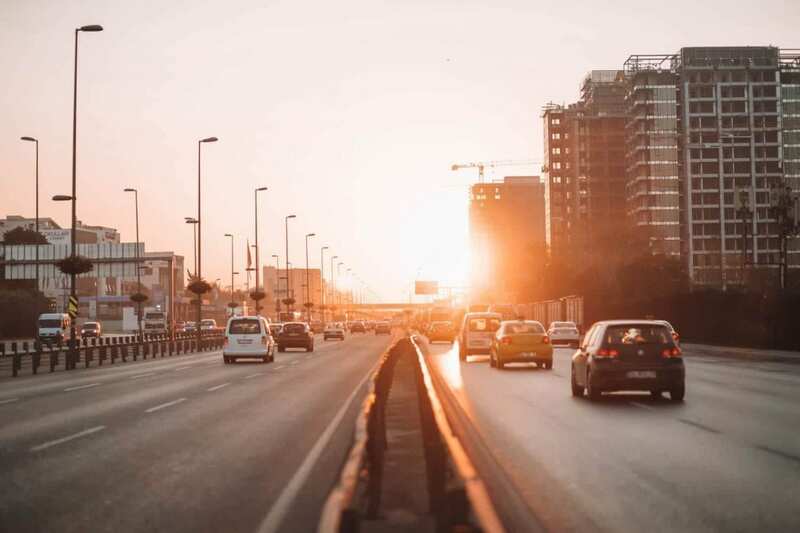 The driving style in the city is more aggressive than in South Africa. If you’re not used to driving in a place where rules are only a guideline, it is a stressful experience. Just a head’s up – your Uber driver will call to ask you where you are and ask you to direct them to your final destination. I don’t know why they do this when there is a map on their phones that they can follow. I would avoid selecting the “chap chap” option if you’re paying with credit card. These drivers often decline rides if they see you aren’t paying cash and this can be a problem if you’re trying to get home late at night. If you want to explore the city like a local, grab a motorcycle taxi. The drivers often wait for passengers nearby busy intersections and are cheaper than Uber or Taxify. There are also matutus (shared mini-bus taxis). If you want to take this mode of transport, I suggest buying a sim card so you can track on Google Maps where you want to get off. There aren’t designated stops, and you’ll need to speak to the locals to find out the different routes, but you’re bound to have an adventure! The currency in Kenya is the Kenyan Shilling. While exchange rates do go up and down, the Rand is usually a bit stronger. You can expect to get 7 KES for 1 ZAR. You only need to have US dollars if you’re paying for a visa on arrival. Otherwise, you can withdraw cash from any of the ATMs. You’ll get a better rate of exchange than going to a currency converter kiosk at the airport or in the city. Check with your bank if they have a card option where you aren’t charged for overseas withdrawals! The best place to stay in Nairobi for digital nomads is Westlands. It’s where you’ll find plenty of shops, restaurants, coffee shops, coworking spaces, and even a rock climbing gym. I regret not staying here because it was a constant commute to get to places. Traffic in Nairobi is bad, so even spots only 4km away took 20 to 30 minutes during peak hour. The only downside is that Westlands is a popular place to stay. Airbnb rentals tend to start over 50 USD per day. If you’re looking for somewhere cheaper and don’t mind taking an Uber to get around, grab an Airbnb in Kilimani. You can find entire furnished apartments for USD 26 per night. I stayed at an apartment on Muringa Road, and it was close to a gym, Yaya shopping centre, and a few restaurants. Most places have more than one bedroom, so you can easily split the cost of rent with a few other digital nomads. Laundry machines are standard in the apartments, and most places will have a clothing rack outside on the balcony. For the most part, the WiFi in the city is excellent. The connection at my apartment was fast, stable and only kept me offline for a few hours when the power tripped. The internet connection at cafes is not the greatest. I’d only recommend working at a coffee shop if you’re catching up on emails or doing stuff that doesn’t require a fast internet connection. Out of all the cafes I went to Wasp and Sprout had the best WiFi that gave the least amount of hassles. As soon as you leave the terminal building at Jomo Kenyatta International Airport, you can buy a sim card from one of the kiosks. Safaricom is the most popular brand in Kenya, but I decided to go with Telcom as it’s a company we have in South Africa. I got 20 gigs of data for 2,000 KES ( R 270.00). Kenya uses an e-money service called M-Pesa. You can register for it with your Kenyan phone number and passport. The service allows you to load money onto your phone and text people money. There are a few places like Lukenya Nature Reserve that only accept M-Pesa as a form of payment. If you’re going to be in Kenya for awhile, it’s worthwhile signing up for it. You won’t need to carry cash around, and you can always withdraw from your account if needed from an M-Pesa agent. Nairobi Garage is rated one of the best co-working spaces in Nairobi for digital nomads. Located in the Westlands and Ngong Road, you’ll have access to communal desks, boardrooms, a conference room, 150 Mbps wifi and a rooftop event space. 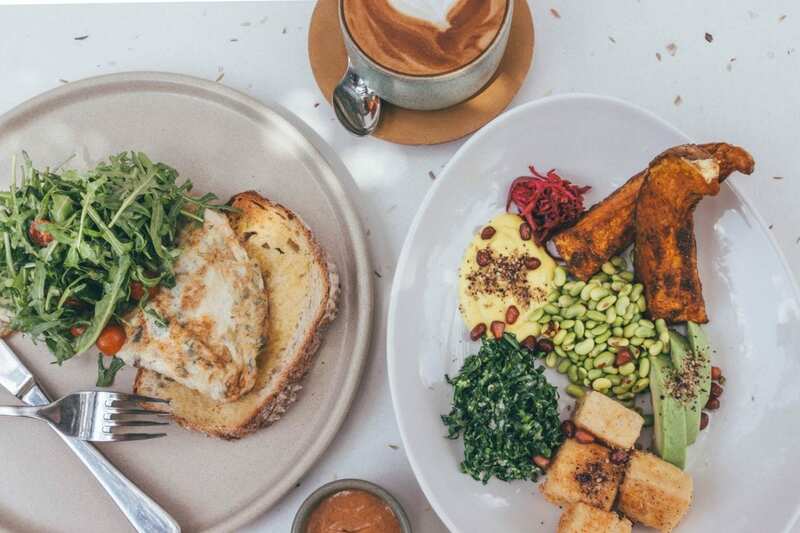 If you don’t want to walk to The Junction Mall for lunch, you can grab something from the in-house cafe or whip up something in the fully-equipped kitchen. Daily rates are 2,000 KES ( R 278.00), and monthly packages start at 20,000 KES ( R 2780.00). 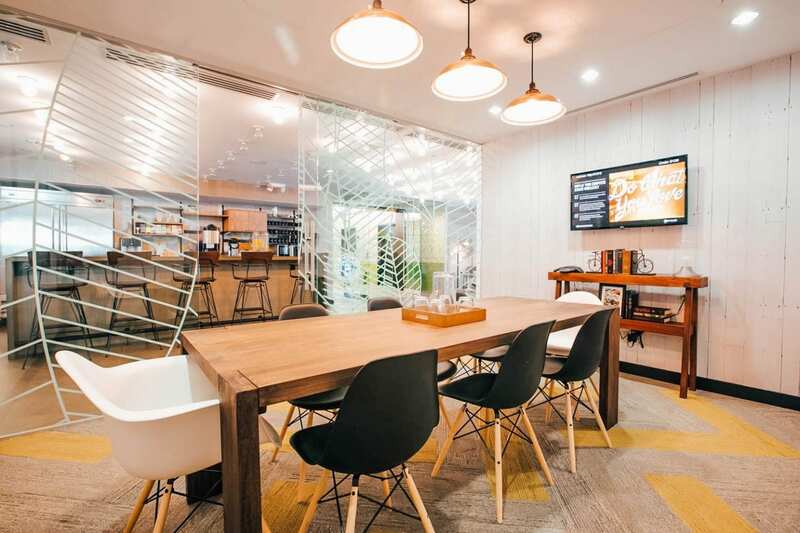 Want all the extras at your co-working space? Set up shop at The Foundry in Westlands. Your monthly subscription will get you 24/7 access, biometric access control, free coffee, Xbox consoles, zen gardens, pool tables, reliable internet, and networking events. A dedicated desk for the month will cost you 20,000 KES ( R 2780.00). iHub is the perfect co-working space for digital nomads in the tech industry. It’s where you’ll find entrepreneurs and startups working on innovative projects that aim to shape the future of technology in Africa and the world. A community desks membership is 7000 KES ( R 970.00) for the month and includes 12 hours access to the space. If you want 24/7 access and office management services, you can get a dedicated desk package for 20 000 KES (R 2780.00) a month. Fresh fruit and vegetables in Nairobi are cheap. For a week’s worth of groceries, I paid around 1,500 to 1,800 KES ( R 200.00 to R 250.00). However, if you want to order of off Uber Eats, eat fast food or go out to restaurants, you’ll pay a lot more. A pizza in Nairobi starts at over 1,000 KES (R 140.00) for a margarita. 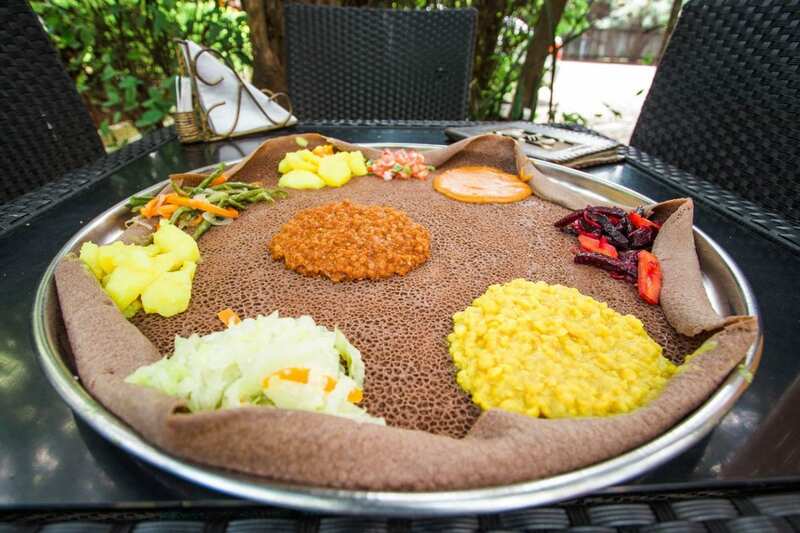 A vegetarian platter at an Ethiopian restaurant costs 800 KES ( R 110.00), and a gourmet burger will set you back 950 KES ( R 132.00). It is not safe to drink the tap water in Nairobi. You can buy small bottles of water from the shops, or have 5-liter bottles delivered to your apartment. I recommend bringing a reusable water bottle. Restaurants, gyms and most of the apartments will have a water dispenser you can use. Gym memberships in Nairobi aren’t cheap, but I found a few good deals that will help keep you fit in between work and exploring. Ultra Fit has a monthly membership for only 4,000 KES (R 556.00) if you go during off-peak hours. Plus, that rate includes a personal trainer. The gym is open is open Monday to Saturday from 6:00 a.m. to 9:00 p.m. If you’re into cross fit, sign up with Alpha Fit. Your monthly membership includes access to a bunch of classes such as yoga, cross training, kickboxing, and aerial fitness. You can also hire a personal trainer for 1, 500 KES ( R 208.00) per session and packages start at 8,000 KES ( R 1,100.00). Blue Sky is Nairobi’s only indoor rock climbing gym. Inside you’ll find over 100 top rope routes, bouldering walls and hang boards. The gym also organises monthly climbing trips to Hell’s Gate and Suswa. Day passes start at 800 KES ( R 111.00), and a monthly membership will set you back 4,000 KES ( R 556.00). Visit the Giraffe Center: You’ll have the opportunity to feed the endangered Rothschild giraffes (if they are hungry). Plan your visit around 8:30 am to avoid the crowds. Entrance is 1,000 KES ( R 140.00). Adopt an Elephant: Visit the David Sheldrick Elephant Orphanage and adopt a baby elephant for 50 USD. You’ll get to visit the sanctuary after hours with hardly anyone else around. Watch the Sunset from the KICC Helipad: The Kenya International Convention Centre is one of the tallest buildings in Nairobi. For 500 KES ( R 70.00) you can take the elevator all the way to the top for a birds-eye view of the city. Go on a Day Trip to Hell’s Gate National Park: The park is famous for its dramatic scenery and hiking trails. You can hire a bicycle at the entrance and cycle past herds of giraffe, zebra, and antelope. Entrance is 25 USD per person. Toi Market: Get a feel for the pulse of the city and spend your Saturday morning walking through Toi Market. It’s one of the best spots in the city to find second-hand goods, thrifty clothes or fresh fruit and veg. Visit Nairobi National Park: If you don’t want to make the trek over to the Masai Mara, a safari in Nairobi National Park is the next best thing. 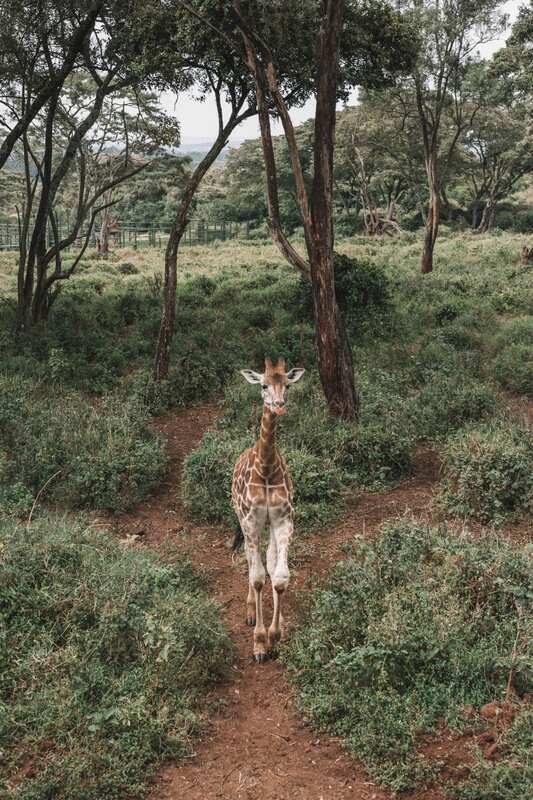 There’s also a Nairobi safari evaluated walkway that weaves around the reserve, giving you uninterrupted views of the wildlife below. Are you a digital nomad? Have you got any tips for working remotely in Nairobi, Kenya? Hi Anita! If you’re leaving the airport, the officials will ask to see your yellow fever certificate before you go through to baggage collection. I’d phone your local travel clinic to see if it’s safe for your children to get the vaccination etc. We’ve been to Nairobi four times and never thought of it as a digital nomad place or that it would ever have a coworking space! You’ve had me thinking…. I’m glad I’ve changed your mind 🙂 It’s a wonderful city!